I had two birds crash into my office window today. I screamed one time and then felt bad for the birds. Now that the snow has come they might want to eat bits of left over apples. So much beauty in each season. Such a pretty winter scene - so glad we aren't there yet though I am sure the white stuff will be on us soon. Love the coloring of this tiny bird! That is a lovely snowy scene, hard to believe you have snow already! 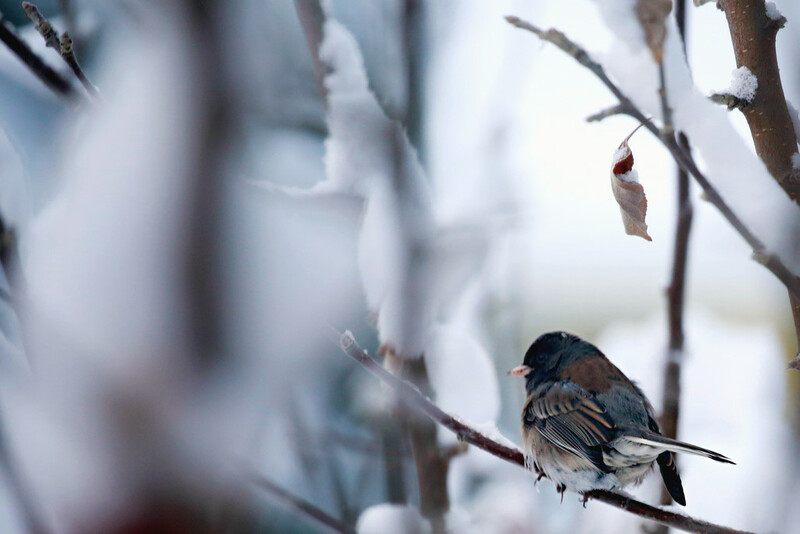 Stunning snowy shot, the little bird is all fluffed up. Like the off-center focus of your composition. So beautiful. My office had mirror reflective windows and the cardinals drove me crazy each spring when they were building their nests, hitting those windows. You finally get used to it. I always thought they had to damage their beaks. This is a lovely photo. So beautiful! We had no snow at al last year, think my project would like some this year! A lovely shot, the bird looks snuggled up and warm under those toast feathers. Lovely capture and a cute little bird in the snow. Hi, I am your get pushed partner this week, I would like to set the challenge of a long exposure still life with a low key outcome, your choice of subject. Hoping this will give you practice in using your camera manually & working with light.